Can We Kill Two Birds with One Stone when it Comes to Light Rail Planning? With all the controversy about the Southwest Corridor alignment (especially its rising construction costs), a question could be is why don’t we merge the Southwest Line project with the planned Bottineau Line project? Matt Steele’s post from last month has some great ideas on improving our light rail system, but I have another idea similar to this. We could merge both the Blue Line (Bottineau) and Green Line (Southwest) light rail expansion projects into one megaproject, focusing on building better “starter” portions, similar in a way to how the planned Nicollet/Central streetcar project is being built. We could focus on connecting the southwestern and northwestern portions of the metro area via stepping stones, and worry about expanding towards the suburban corporate campuses of UnitedHealthGroup, and Target later. Getting funding for this might be complicated, but I feel that we could make a valid argument for this to get state and federal funding for a joint project that serves both lines. Outer suburban areas would not probably like this option since initially it’s only benefiting first-ring suburbs and dense Minneapolis neighborhoods, but we could argue that this still allows better suburban-city transit, and could be an initial step towards easier city-to-suburban or suburb-to-suburb commuting in these regions. They can always park and commute downtown via stations in Robbinsdale or Saint Louis Park for the first few years. While I understand this means larger park-and-ride stations in these suburbs, I feel that we could plan them in a way where they can be redeveloped as TOD once distant suburban stations are built in the future. Realistically, there will have to be trade-offs to try to gain support from suburban commuters. While we complain about the expensive tunnel plans in Kenilworth, and the streetcar planned for Nicollet, why not scrap the streetcar entirely (and replace it with enhanced bus), and build LRT underground from Midtown to Downtown (the 3C alignment) under Nicollet or a neighboring street. An enhanced bus on the surface would create fewer conflicts on the street compared to a streetcar, while transit-oriented development is still at a high demand near light rail stations on Nicollet. The 3C alignment would create a large part of the planned Midtown Greenway’s streetcar line, meaning less construction costs for that line’s expansion toward the Blue Line at the Lake Street-Midtown station. Once the Green Line gets on the Greenway, the light rail would continue heading head towards Uptown, and then ending up either at Uptown, West Lake, or Louisiana stations (depending on how far they can go with the initial funding). I’d say at least build to Louisiana so there is at least one station in Saint Louis Park. 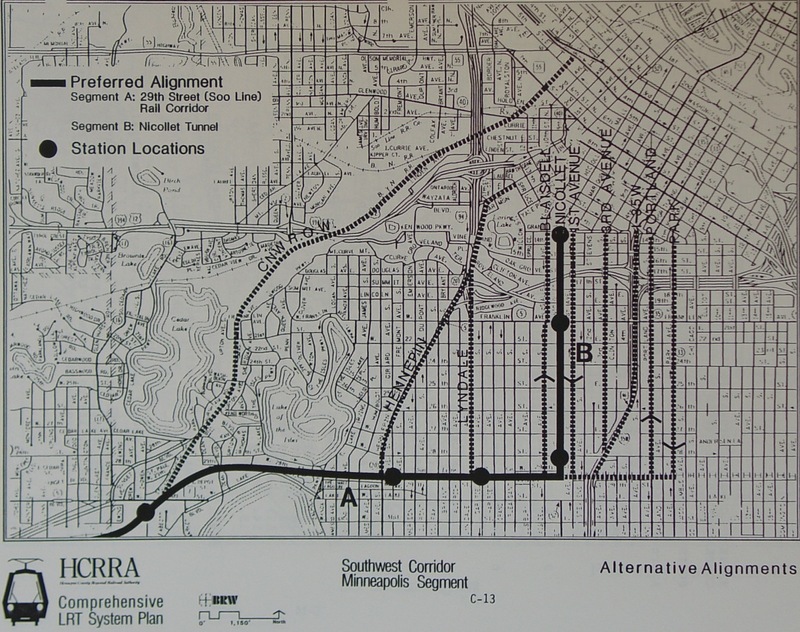 Whenever the Midtown streetcar line is fully built, streetcars could still go down the greenway on the same track (just have them both run on standard gauge with electrified overhead lines at 750 V DC), meaning that travel from Uptown to Midtown (and all the way towards Lake St/Midtown Blue Line station) could still happen via a rail option even if the corridor has LRVs operating on it as well. I would recommend just focusing all of our rail vehicle purchases towards purely LRV’s so they can be used on other transit corridors if necessary (unless we want to use streetcars for backups or late-night transit on the Blue and Green Lines). The Bottineau portion could take the more urban route, and then try for an underground line under Penn (Option D2 on Bottineau Draft EIS), and then have initial segment end at Robbinsdale instead of the planned initial endpoint at Target’s suburban business campus in Brooklyn Park. I feel that the Golden Valley portion does not make sense in ways similar to the Kenilworth/Uptown routing fiasco with Southwest. While an underground portion under Penn may be expensive, there isn’t enough ROW on the surface unlike the wider boulevard portions of Highway 55 and Bottineau. Future expansion can still go towards both Maple Grove and Brooklyn Park, but I would recommend single-track spurs to Maple Grove – Arbor Lakes/Hemlock Lane (Option A on Bottineau’s EIS draft), and Brooklyn Park’s Target Campus (Option B on the EIS), with 20-30 minute headways, which could coincide with the main line’s 10-15 minute headways (71st Ave Station in Brooklyn Park to Downtown Minneapolis). Sam Rockwell’s post, along with Sam Newberg’s post from earlier this week bring some valid criticism when it comes to the future of Nicollet Mall. Like quite a few others on streets.mn, I feel that Nicollet Mall could be more open to pedestrians and cyclists if we built the Southwest/Green Line expansion mostly or fully underground in the downtown core under the mall. While the initial cost of the tunneling would be quite expensive, planning for long-term transit benefits should be factored in especially when it comes to the population expansion of Central Minneapolis. I’d rather see a better pedestrian, but bike-friendly mall instead of an at-grade streetcar line dividing the largest and densest commercial district in the entire state. I would say that the only vehicles allowed on the mall other than emergency vehicles could be street vendors (food trucks, farmer’s market, etc.) to line up along the corridor during warmer months (skyway vendors could always have food trucks if they are worried about a decrease in business during warmer months). A main issue with having rail go underground downtown would be connecting it to the Blue Line somehow, such as connecting an underground single (or double) track turn to connect it at-grade near the current Nicollet Mall Station. A single-track turn could do in my opinion, but I have no experience when it comes to civil engineering, so I will admit that I don’t know how difficult and expensive this option may be to build. Also, being aware of the possibility of that this underground part of the line expanding towards Northeast Minneapolis at a later time can be used as a trade-off since the streetcar project would probably be cancelled if LRT ends up on Nicollet. Overall, since we have limited transit funds, we should be focusing on starting a rail network that allows small starter lines (allowing more parts of the metro to have at least some rail transit options earlier than planned) that connect our densest residential neighborhoods and commercial districts initially, with the option for incremental expansions of 1-2 more suburban stations every few years, instead trying to build entire lines that focus solely on one portion of the metro area every 10-15 years. My ideas aren’t flawless, but I feel that this could bring more solutions into solving our transit planning crisis. 24 Responses to Can We Kill Two Birds with One Stone when it Comes to Light Rail Planning? The current Bottineau alignment, although it’s not getting one thousandth the press, is every bit as stupid and infurating as the through-the-woods SW alignment. Perhaps more, because it’s turning its back on a neighborhood that truly needs it. I don’t know the degree to which the route is set in stone, but with what we’re learning from the SW, the sooner people talk about it, the better chance it has of being changed. 3C also turns its back on a neighborhood that truly needs it. I think I was pretty clear that I’m absolute a proponent of 3C. But I do think it’s worth acknowledging different levels of “need”. Uptown would be awesome with light rail. But it’s clearly surviving without it. I’m not sure the same can be said for some parts of North. I believe David means that switching to 3C deprives North of the two stations on the proposed SWLRT route. Of course, the Royalston and Van White stations, which are nominally on the North side of the dividing line, are surrounded by nearly zero residents within easy walking distance, but David has made the point repeatedly on MinnPost that they will be key transfer points for people arriving at stations by bus. Btw, what are the plans for the Penn Ave station? I walked down Penn from Broadway on Saturday and it’s not exactly welcoming or easy to get from Penn down to where the rail tracks are, much less across into Kenwood. Without significant improvement, it will be interesting to see how many riders walk to the station from the north. Ah. Well Matt explains you’d have to be awfully gullible to fall for people caring about north Minneapolis as anything but a ludicrous post-facto justification of a sub-par route. If people want to make the argument that the current alignment is the only political feasibility fine but let’s not kid ourselves on its quality. I’m going to take David’s sincerity at face value, but, without having made careful study of it myself, I’m rather skeptical of the value of those two stations to North in general. They are on its very border and they are stations in the middle of nowhere and I would think transferring at Target field would be just as useful. And, of course, Bottineau should be routed to actually be accessible our north side residents. Hmmm… you seem to be assuming 3A would actually serve those neighborhoods. Routing SWLRT to serve North Mpls is like routing high speed rail from Minneapolis to Chicago via Memphis. It doesn’t discredit the fact that Memphis has equity issues, and it doesn’t mean Memphis doesn’t deserve HSR to Chicago. It just means it makes no sense for HSR to go from Minneapolis to Chicago via Memphis. Just as it does not make sense for *Southwest* LRT from Hopkins/EP to Minneapolis to go via the North Side. But of course this is all a moot point, unless SWLRT dies and needs to return to go. Although I did propose a few slight changes which would save us big money now and leave open the possibilities for route flexibility down the road (see link near the top of this post). Understandable, which is why I recommended the D2 alignment with Bottineau to help serve a couple neighborhoods in North Minneapolis. Maybe a bus route could serve the communities that would have been served by the 3A alignment. There’s three main problems I see with 3C, which is essentially what this article is arguing for. Terrible network alignment, poor timing, and cost/nimbyism. We already have tracks and stations running along 5th in downtown. Metro Transit is about to complete a multi million dollar transit hub at Target field to serve as the cornerstone of four LRT lines. The Greenway coalition has consistently advocated for streetcars along the length of the trench (thinking about it long-term, there probably wont be much push for a $100m streetcar line along the less-traveled eastern half of the trench, and fitting in a place to transfer would be very hard). Added to this is the difficulty in making the turns out of the greenway and onto 5th from Nicollet. With the HCMC site and new Nic apartments its pretty much impossible at this point. The 3C ship sailed long ago for planners. I’ll get to the last two in a bit but from a practical standpoint I’ve still not heard answers from the Uptown Idealists yet. Thanks for the input, I’ll admit that this idea isn’t flawless and that the 3C alignment would be difficult to engineer given many of the points you stated. Since I combined both rail lines into one project, I just felt that the 3C alignment seemed more effective overall to me compared to 3A since these would be essentially “starter” lines. Would tunneling under a neighboring street or under Lyndale (or Hennepin) be more beneficial (while still understanding the engineering and cost difficulties)? I just feel that underground rail under Nicollet would be more beneficial with enhanced bus on the surface, compared to a streetcar. What if it doesn’t go down Nicollet Mall and instead comes out of the station and turns onto Royalston exactly as it’s currently planned to, but instead of dropping into the rail corridor continues on to 12th St. as shown in Matt’s link above? How would this interlace with the existing Green Line, or wouldn’t it? That’s a major issue I see. Granted it would serve Uptown better, but as far as people from the suburbs it would be less optimal even if it were extended all the way out. Besides the extra time, once it comes downtown, do you turn it to the west to the Interchange station for people going to Twins games and the warehouse district and make those going to the U or downtown St. Paul transfer? 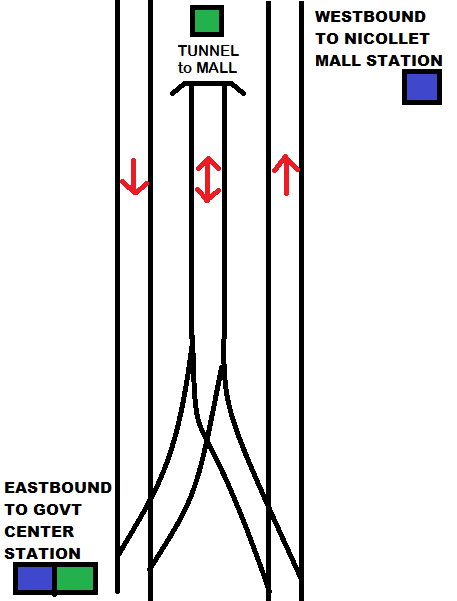 Or do you turn it to the east and make people going to the Interchange transfer or walk several blocks? Or is it even possible to interlace it at all and everyone has to transfer at 5th and Nicollet? I guess people from the suburbs do go to Uptown. It’s been 20 years since I’ve been anywhere there besides riding my bicycle around Lake Calhoun, and I don’t have any friends that go there, but someone that lives there mentioned they do see people from the burbs there. Still I’d imagine this is small compared to the number that want to get to their jobs downtown fast, or be able to go to the U without transferring. My reasoning behind a tunnel under Nicollet over the 3A route, is that I feel that if Nicollet Mall is getting remodeled, that a rail tunnel should go under it now instead of a surface streetcar (to avoid digging up the mall in the future), which I feel would divide the mall like the current road does. To further clarify about rail transfers, I probably would have an underground station under Wells Fargo and RBC Dain Rauscher Plaza with elevator and stair/escalator access to that station via an outdoor entrance in the former Nieman Marcus building. It would be kind of an annoying transfer for heading to the North Loop/Target Field, but I have the tunnel set up so it could be extended towards Hennepin Ave and then it would go at-grade towards Northeast for a future LRT line. I also supported the 3C alignment due to remembering seeing that a map showed there were a bunch of commuters and reverse-commuters between the Golden Triangle and Uptown in contrast to the 3A alignment. I’m trying to remember where I saw it (The Transport Politic, maybe or a personal blog), but I’ll try to find a link to it. Overall I meant this idea to be kind of a basic LRT plan to promote “starter” lines and small expansions towards suburban areas versus building full-fledged lines every decade or so. Minnesota has its own internet domain?! Do any other states have their own as well? Is there any kind of secessionist movement in Minnesota? I can see the benefits of Minnesota joining Canada. That’s supposed to be a secret, eh? Hoser. IIRC, the Wells Fargo building has a 2nd basement that was designed/built to accommodate a potential LRT station for a line underneath 6th St…that being the going thinking at the time based on the ca 1990 BRW study of what was then proposed as Hennepin County’s LRT system. I have a couple scans of that midway down my transit planning scans page. Al’s proposal reminds me a lot of that 1990 study. Though it would serve Uptown, a HUGE disadvantage of the 3C alignment for Southwest is that it would not interline with the Hiawatha and Central lines (sorry, but I cannot bring myself to use Metro Transit’s color designations, not after spending 4 years in DC). This adds operational costs to Metro Transit and makes it either impossible (without a connection) or more expensive (to build a connection) to use LRVs from one line on the other. A lot less flexibility with that setup. 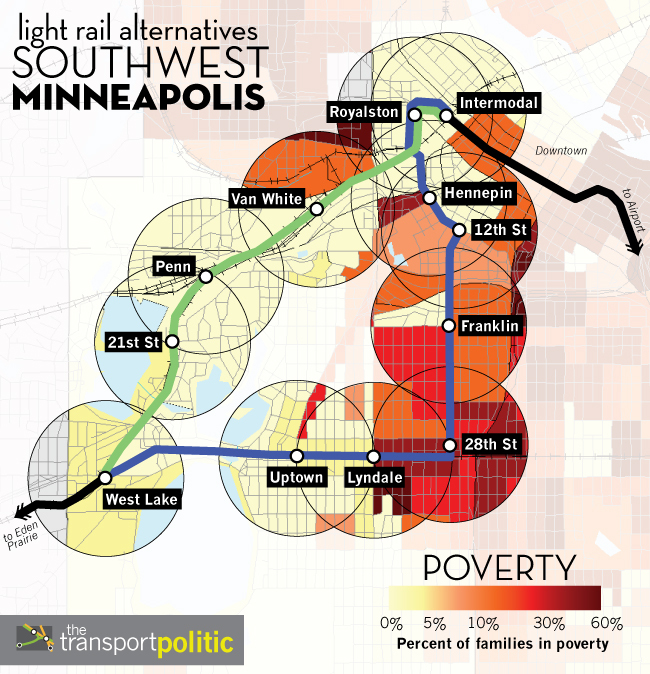 That is why I support Southwest interlining directly with Central/Hiawatha, and using streetcars for the Midtown Corridor and Nicollet Ave.
It’s on a similar vein that I support the existing alignment proposal for the Bottineau LRT line, and a streetcar along Washington and West Broadway to the Robbinsdale transit center. I believe the additional cost for putting Bottineau in a tunnel under Penn could be utilized instead for the streetcar line. To follow this up, just keep in mind when doing your fantasy transit planning that the minimum turning radius of the Siemens S70 is 82 feet (or 25m). A portland streetcar’s is 18m (59 ft). A streetcar can make the turn at-grade from Nicollet to 5th as well as the turn north out of the greenway trench, while our LRV’s can’t. That is true, I would say that if the Southwest Line stays at the same route (which it probably will), that we could build the streetcar on Nicollet underground similar to the Green Line has some undergound stations in Boston. Since that means that will cost even more money, I dunno how that would go for trying to find additional funding. I just feel that at least Nicollet Mall itself should have it’s rail corridor underground so the mall because it could become a purely pedestrian and bike mall (with food trucks and farmer’s markets lining along the mall during the summers). I follow the 3C alignment so it can be used in lieu of a streetcar. An enhanced bus would still make it’s way as a mix between a local/limited-stop bus all the way to southern Minneapolis and most likely Richfield. I understand the LRT turning radiuses make it difficult to engineer for tight turns compared to streetcars, but I feel there could be a way to work around those (such as for Penn’s underground portion, the entrance and part of the turn could be built under 55). Honestly, I’d be fine with the Southwest line going under Lyndale or Hennepin (relocate the YMCA maybe to have more room for a turn on the Greenway? – I saw that this is getting discussed about on UrbanMSP) along with the Nicollet Streetcar, but I was planning this to try to build urban underground LRT portions under planned streetcar lines to try balance construction costs and to get a decent “starter” urban rail network which can later be connected to more suburban areas. The problem is, we are at the point in the process for BOTH lines (Southwest and Bottineau), that to either do what you suggest or to reopen alignment considerations, we’d effectively have to start the planning process all over again. At a minimum, we’d be adding 2 years to the project timeline. These are just more ideas in case if the Southwest and/or Bottineau plans end up getting derailed (no pun intended), which is plausible given the controversies they have made (mostly on Southwest’s end). Then we might be back at the drawing board regardless. Basically it’s kind of a way to elicit more debate on what we could do if that happens, and I do hope that the SW and Bottineau LRT gets built one way or another, but I figured I would give my two cents on the matter. I think this is roughly what you are proposing. Streetcar lines can be built up to full heavy metro standards and still maneuver within our city. Yep, pretty much (I wish I remembered about those when I was creating my article initially – I probably would have written about them instead). I am not against streetcars, but I am skeptical towards at-grade portions when the roads are 3-lanes or less. The streetcar portions on Hennepin and in NE Minneapolis that are on wider roads, along with possible streetcars on Broadway and Washington I am more respective towards since they would have more space to run freely. I just used the planned LRT lines under their more urban alignments (aka the now streetcar corridors) in lieu of the actual streetcars, as a tradeoff since tunnels would make the LRT projects more expensive so combining rail projects seemed like a possible idea. Maybe Blaisdell could be turned into a two-way street to absorb some of the Nicollet traffic after the streetcar is built. I really don’t understand why the 3C alignment didn’t go down Hennepin or Lyndale in Uptown and then continue down Hennepin in Downtown. This would be by far the most used line as it would connect Uptown/Downtown Mpls/U of Mn/Downtown St. Paul without needing to transfer. I could even see it being completed without the need for tunnels. With the growth of density in Minneapolis, we simply can not afford more car traffic. This would make getting around Minneapolis without a car considerably easier for those that don’t bike. Finally, continue the Nicollet pedestrian mall, all the way to Lake. I could live with a streetcar line down Nicollet, but definitely no cars/taxis/buses.